The Monday following Thanksgiving weekend I took a hastily planned trip to Yosemite Valley. The trip was motivated by an encouraging weather forecast that called for partial cloud cover throughout the day ahead of an incoming storm. And while the forecast (mostly) delivered with a nice sunrise at Tunnel View, it was again an unexpected element that made the trip worthwhile. I’ve released a number of new images from that morning in a new galley that, for now, is simply entitled “Recent Work.” I’m sharing three of them here with a bit of the backstory. As the colorful sunrise at Tunnel View came to an end, I hopped in my car to head down into the Valley. My plan was to stop at Cathedral Beach to see if the cloud cover made for an appealing image. And I did, but the water level was very low, the light was flat, and I spent no more than a minute there before deciding to continue looking for a more appealing scene. And it wasn’t long before I saw rising fog in the meadows further west in the Valley and jumped out of the car, tripod in hand. The process of capturing these images was quite straightforward. I simply stood in the middle of a meadow with the camera on a tripod and a long zoom lens (a 100-400mm) and explored the scenery through the lens, taking occasional shots when the composition or shifting fog made for an appealing scene. A bit of lingering fall color caught my eye here and there, and I tried to incorporate it in many of the images I captured. The combination of elements—low fog, soft light, and touches of orange and yellow—did most of the work for me. Back at home later on, the process of reviewing these images was quite enjoyable. They required very little post-processing work in the computer aside from minor adjustments to brightness and color, as well as some cropping decisions to improve on my initial compositions in the field. 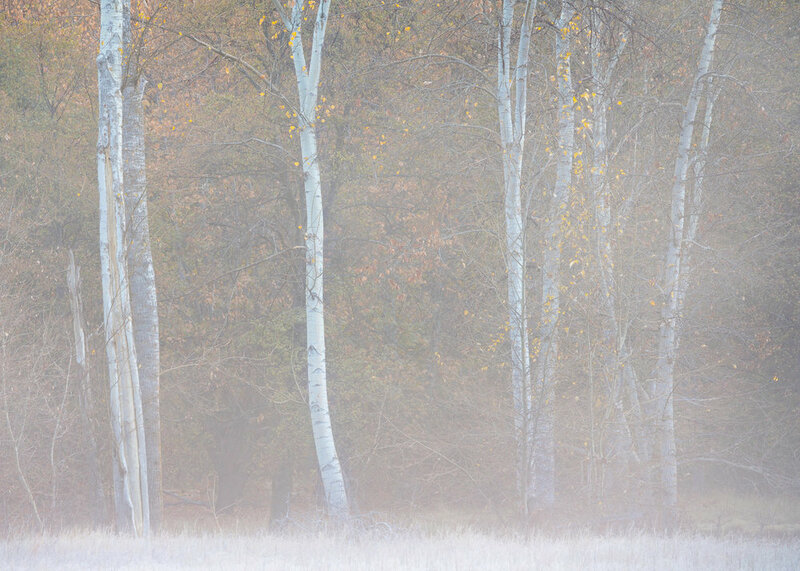 The bright meadow was a bit troublesome in some images—the low fog almost looked like snow (which is not a bad thing) and was sometimes distracting—but it was easily adjusted to a more pleasing level. And the fog itself made for an ethereal feel in many of the images, particularly the second image shared in this post. Altogether, the images shared in the “Recent Work” gallery were captured over the course of about 90 minutes. All but one was shot in a single meadow and required nothing more from me that walking a bit from place to place. Only one other photographer was in the meadow during my time there, and a few casual tourists stopped at the fringes for quick pictures before moving on. It was almost easy to forget that I was in Yosemite Valley and that the same meadow is thronged with tourists most of the year. None of these images are titled yet. Sometimes the process of titling images is easy, sometimes not. It would be easy to title one or two of the images by reference to the time of year and the conditions (e.g., “November Fog, Yosemite Valley”). But I’m going to let them sit for a while before deciding on titles and whether to include all of them in a separate gallery on this site. I hope viewers find them enjoyable. In early June 2017, I took a day trip to Yosemite Valley hoping to capture some images of Half Dome and other Valley landmarks reflected in pools of remnant floodwater on the Valley floor. The experience was a good reminder of the need to remain open to other image opportunities rather than staying wedded to preconceived ideas of how to spend time in the field. But before getting to that, here's an image (Flooded Meadow and El Capitan) of El Capitan reflected in the flooded fringes of a meadow along the Merced River. I was quite happy with this capture and it is essentially what I had in mind traveling out to Yosemite that morning. Finding this perspective on El Capitan took a bit of hiking and willingness to get wet. But it's a nice feeling to explore the Valley floor without anyone else around, as was the case on this morning. Minor flooding on some of the trails helped keep traffic to a minimum, and over the course of four hours (including time spent capturing the low clouds along the Cathedral Spires, below) I only saw 2-3 other people. Hiking away from the flooded meadow, I walked for only a few minutes before noticing a low mass of clouds moving rapidly along the edges of the Cathedral Spires across the Valley floor from El Capitan. I tried some long lens (Canon 100-400mm) shots of the clouds mingling with the Spires, eventually moving the camera over to the tripod for stability. Over the course of a couple of hours, this produced some of my favorite shots of the morning. Crowned by Clouds, shown first here, is one of the initial shots I took of the clouds flowing down and across the distant cliffs. I tried many other variations of the same scene, zooming in and out and capturing different cloud patterns, but I eventually settled on this one with a black and white conversion to really enhance the impact of the clouds. The cloud patterns constantly changed and I tried a lot of different compositions to accentuate their movement against the cliffs. The following image, Touch the Sky, is one of the rare times I've felt the anticipation of a scene developing in front of me. In the space of just seconds the clouds unfolded in a dramatic, wave-like pattern that crested over the top of one of the Spires. I have only one shot of the small tree shown in this image not blocked by clouds. I think it adds greatly to the overall scene. This image was taken near 12:00 and, along with Crowned by Clouds, is far from what I expected to capture that June morning in Yosemite. The flooded meadows I had hoped to find were few and far between, and as the day went on the Valley filled with visitors and the clouds drifted away. I ended up not even sticking around for the sunset--a rare thing for me to miss when I get to spend a day in the field--but I felt certain I'd had a productive morning and more than justified the trip out to Yosemite. All content on this site is copyrighted © by Phil Pogledich. All rights reserved. Images may not be used without permission.